Literally-Sarcastic: The █████ about █████ and ██████. The █████ about █████ and ██████. Do you like the internet? I do. Do you hate censorship? You probably should. You! You can actually do something about SOPA/PIPA! For reals! Contact your government peeps and let them know that free knowledge is important. Hey, since the government people don't really seem to care about the internet, perhaps communicating to them through other means would be even more effective, yes? So if you want to be an extra big sized hero, you can find out who your government peeps are here and contact them in more dinosaur type ways. Speak their language, etc. 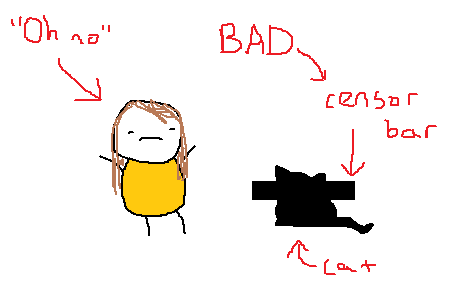 Why is that black cat censoring that censor bar? Im going to write my congress person about these censor cats! Seriously. Censor cats are doing us all harm. Don't censor me, censor cats, or I'm gonna censor your face with my FIST! It is an outrage. We must act right meow.